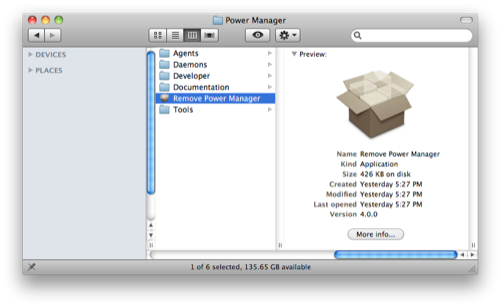 Before Power Manager can be used, it must be installed on your Mac. Installation is required because Power Manager works closely with macOS, and to achieve this we need to place files in various locations outside of your home folder. Removing, or uninstalling, Power Manager is a little different from other application only products. Even though the process is slightly different, removing Power Manager remains simple thanks to an included removal tool called Remove Power Manager. Do not use third party tools to remove Power Manager, and do not attempt to find and remove all the files by hand. Both approaches are prone to mistakes and leaving files behind. The only sure way of removing Power Manager is with the included removal tool. Power Manager can be left uninstalled in your Applications folder. Only if the scheduler is installed will any scheduling occur. Having Power Manager available, but not performing scheduling duties, is designed where access to pmctl, documentation, or other aspects of Power Manager are needed. To temporarily stop the scheduler, see Procedure 5.1, “Start/Stop the Scheduler”. To remove the scheduler, see Procedure 8.1, “Removing Power Manager's Scheduler”. To remove all of Power Manager, see Procedure 8.2, “Removing Everything”. Select the menu item: Scheduler > Remove Scheduler…. If you want to remove all of Power Manager, including the scheduler and application. The best approach is to remove the scheduler and then drag the application to the Trash in the Finder. Alternatively, you can use the included Remove Power Manager. 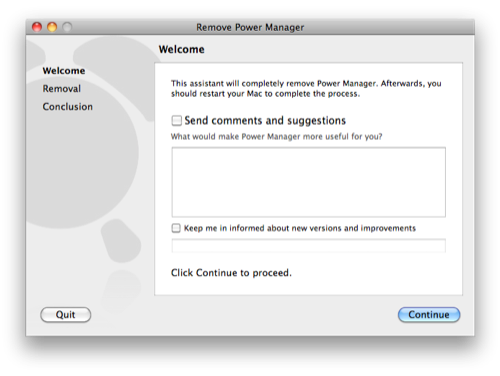 This application will remove Power Manager entirely from your Mac. Follow the steps to confirm and entirely remove Power Manager. The Remove Power Manager tool mirrors the installation process. A series of steps are presented that will walk you through the process and ensure you have the appropriate administrator privileges to continue. The Welcome step provides an opportunity to send us comments and feedback about your experience using Power Manager. Your feedback is appreciated and helps us improve future versions. Please note that anonymous comments are supported but generally carry less weight than comments associated with a real person. If you do not wish to send any feedback or be kept informed of updates, disable (uncheck) both of the checkboxes before continuing. 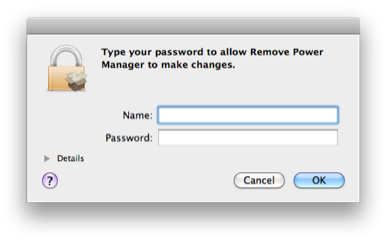 Before you can remove Power Manager, you will need to demonstrate that you have administrator privileges. This is done by asking you for an administrator user name and password. In most cases, this will you be your normal user name and password. By entering your administrator details, you are authorising the Remove Power Manager tool to remove all Power Manager installed files from your Mac. Before removing, the Power Manager Removal tool will confirm you are sure. The Removal step performs the tidying up and removal of Power Manager files from your Mac. This step will take a minute or two. After the removal has finished. The Conclusion step is displayed. If all went well, you should now restart your Mac. After restarting your Mac will no longer be running Power Manager. A restart is required to ensure that all of Power Manager’s assisting agents are quit and no long available in any caches. You do not need to restart immediately and may continue using your Mac until you are ready to restart. You can contact us anytime with your feedback, at <support@dssw.co.uk>. Chapter 7. Defaults and Preferences Home What is Removed?